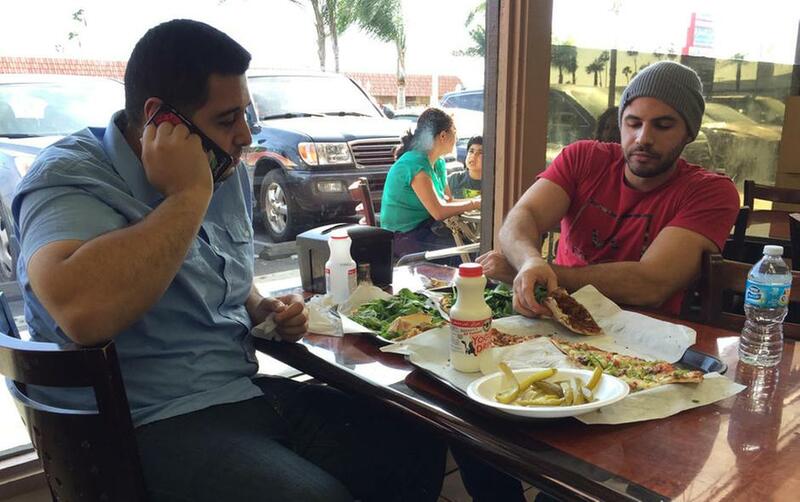 Nas Juma, 22, left, and Omar Ghanim, 23, enjoy Lebanese pizza at Forn Al Hara restaurant in Orange County's Little Arabia in Anaheim, Calif., Tuesday, March 22, 2016. They discussed remarks made by GOP presidential candidate Sen. Ted Cruz about Muslim Americans in the wake of terrorist attacks in Belgium. Republican presidential candidate Ted Cruz said Tuesday that surveillance in Muslim neighborhoods in the U.S. must be intensified following the deadly bombings at Brussels, while rival Donald Trump suggested torturing a suspect in last year's Paris attacks would have prevented the carnage. DEARBORN, MICH.. (AP) — Some American Muslims feel they are once again on the defensive following presidential candidate Ted Cruz's suggestion that Muslim-dominated neighborhoods should be subject to increased surveillance in the wake of the deadly attacks in Brussels. Ghanim said Islamic State doesn't represent his faith. "They don't follow the Islamic rules or anything Islam," he said. "We're a peaceful people. We're not violent." Cruz said Tuesday that law enforcement should be empowered to "patrol and secure Muslim neighborhoods before they become radicalized." Echoing earlier statements from rival Donald Trump, Cruz also said the U.S. should stop the flow of refugees from countries where the Islamic State militant group has a significant presence. IS claimed responsibility for the attacks at the Brussels airport and a subway station that killed dozens Tuesday and wounded many more. Muslims across the country and groups including the Council on American-Islamic Relations and the Anti-Defamation League condemned Cruz's statements. Many said the remarks were part of a disturbing trend: For months, the Islamic extremist attacks in Paris and San Bernardino, and the intensifying rhetoric of the presidential campaign, have ratcheted up animosity against American Muslims. "We have the same ideology as mainstream Americans," said Osman Ahmed, who lives in a Somali neighborhood in Minneapolis. Surveillance of a Muslim community neighborhood "will send a message that Muslim-Americans are not a part of American society ... and that's the message that terrorism groups are willing to hear." Trump, who has proposed a temporary ban on foreign Muslims entering the U.S., praised Cruz's plan as a "good idea" that he supports "100 percent" in an interview with CNN. The Republican front-runner also intensified his past calls for the U.S. to engage in harsher interrogation techniques, arguing that Belgium could have prevented the bombings had it tortured a suspect in last year's Paris attacks who was arrested last week. Speaking Tuesday in New York, Cruz praised the city police department's former program of conducting surveillance in Muslim neighborhoods. He called for its reinstatement and said it could be a model for police departments nationwide. "New Yorkers want a safe and secure America," Cruz said. "New Yorkers saw firsthand the tragic consequences of radical Islamic terrorism." After the 9/11 attacks, the New York Police Department used its intelligence division to cultivate informants in Muslim communities. In a series of articles, The Associated Press revealed that authorities had infiltrated dozens of mosques and Muslim student groups and investigated hundreds of them. The program was disbanded amid complaints of religious and racial profiling. The Council on American-Islamic Relations, the nation's largest Muslim civil rights and advocacy organization, said the call for surveillance sends "an alarming message to American Muslims who increasingly fear for their future in this nation." The Anti-Defamation League, a U.S. group that battles anti-Semitism worldwide, said Cruz's plan harkens back to the relocation of Japanese-Americans to internment camps during World War II. Linda Sarsour, executive director of the Arab American Association of New York, said she fears for armed groups "who are emboldened by the commentary from people like Ted Cruz and Donald Trump." "What's scaring me more is the kind of potential fueling of these vigilantes and people who might want to take up arms and go patrol Muslim neighborhoods," she said. The Detroit suburb of Dearborn is widely known as the hometown of Henry Ford, who hired Arabs and Muslims in the early days of the Ford Motor Co. and helped create what is now one of the nation's largest and most concentrated communities of residents who trace their roots to the Middle East. Kebba Kah, a 46-year-old Ford employee who was entering a mosque in Dearborn for evening prayers Tuesday, said the bombings in Brussels were "a very terrible thing," and insisted that such attacks are roundly rejected by all Muslims save for "a few radical groups." Associated Press writers Gillian Flaccus in Anaheim, California; Vivian Salama, Jill Colvin, Steve Peoples, Ken Thomas, Lisa Lerer and Alan Fram in Washington; Jonathan Lemire and Deepti Hajela in New York; and Steve Karnowski and Amy Forliti in Minneapolis contributed to this report. Follow Jeff Karoub on Twitter at https://twitter.com/jeffkaroub . His work can be found at http://bit.ly/1N7ImDc .